sych legends and underground gypsy artist ANAK BAYAN. This is a white rabbit style effort with very Psychedelic leads, movements and fuzz. A classic and must be heard to be described, Pinoy rock and Jeepney Rock were the local names for this Psych rock movement. 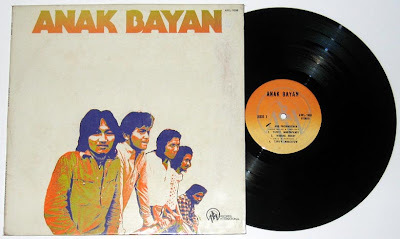 Members of ANAK BAYAN were actually the original core musicians of the legendary Juan de la Cruz band. Drummer Edmond Fortuno's previous band D'swooners were so big in Japan and his wild drumming style really stood out from the rest that he eventually caught the attention of the Plastic Ono band who offered him a drumming stint... Unfortunately, he had to go home. These songs are a collection of recordings that were done in 1973 and were lost for almost 4 years until the tapes resurfaced in '77. It was then mixed and released under A&W records. This is the only album this supergroup ever came out with, and all the original members, except for the sax player, have passed away. 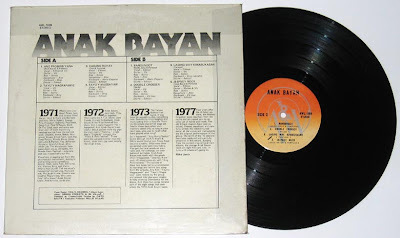 Thanks very much for Anak Bayan, I look forward to having a listen! I was hoping you would be able to re-post the J.L. Bucchi album Sunflower, and the Grupo Fongus album you posted a while back - both had jitter/skip issues on some tracksbut questions about those issues were not answered by you at the time. Do you have fault-free copies of those you could share? Thanks in advance. my first listen of the filipino sound. my fave track is "bangugot" its a perfect mix of flute, sax & guitar. ok the singing is a bit offkey, and i'm being kind on that one, but the melody & instrumentation is superb. cant enough of this rare psych thanks so much! wow, something from the philippines, heh. juan dela cruz band is ace. i love juan dela cruz and listening to their music before they became juan dela cruz adds more to my love for them. bravo! thanks so much! thank you, thank you for this rare gem. wonderful blog. pls. post anything from Juan dela Cruz. Wonderful blog!